We are proud to be an approved Pizza Hut CBT training school, who can offer Pizza Hut CBT training in the North London area. We offer training for Pizza Hut riders from our training site in Tottenham. This site is easily accesible by car, bike or public transport. Being located in North London, our site is ideal for people living in surrounding area's of North London such as Tottenham, Enfield, Edmonton, Southgate, Waltham Cross, Cheshunt, Crouch End, Hornsey & Harringey. Our approved Pizza Hut Training centre in North London is also convenient for people who live in Wanstead, Walthamstow, Chingford, Loughton & Highams Park, but it is worth considering that we also have another Pizza Hut approved training centre in East London (Ilford). Pizza Hut CBT Day 1 is virtually the same as any normal CBT test. The difference with us is that we are probably the cheapest Pizza Hut CBT school in London. 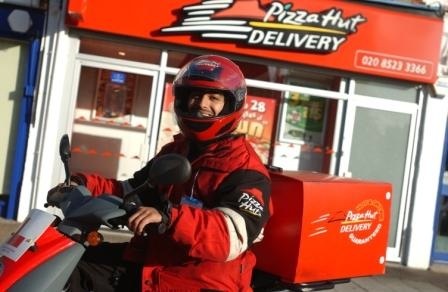 At the end of the day once you have passed your CBT test you will be issued with a DL196 Certificate (also known as a CBT certificate), and will then also be given an approved Pizza Hut CBT rider appraisal form which can only be given out by Pizza Hut approved CBT schools like ourselves. You will be required to show your store manager the Pizza Hut CBT appraisal form that only Pizza Hut Approved training schools LIKE US can give you. In order to attend a Pizza Hut day 2 training course, you must first have passed your Pizza Hut Day 1 CBT course. The Pizza Hut day 2 course is a course exclusively for those who want to get a job working for Pizza Hut. Day 2 can only be completed once you have completed your CBT (Day 1). Day 2 consists of a minimum 4 hours training, which is graded according to an official Pizza Hut marking sheet. Your instructor will asses your riding abilities across the topics prescribed by Pizza Hut and score you accordingly. You must achieve an average score of satisfactory or above in order to pass your Pizza Hut Day 2 test.